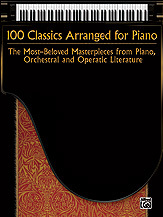 The 100 pieces in this piano collection have been favorites of music lovers throughout the years. Chosen from the four stylistic periods of piano, orchestral, and operatic literature, each selection has been carefully arranged for intermediate-level pianists. For performance ease, editorial markings such as phrasing, expression marks, and dynamics have been added. Within the collection, the pieces appear in alphabetical order according to the composer’s last name. The music will provide hours of enjoyment for pianists of all ages.